It’s Paperback release day, and I’m giving away a copy tomorrow on reddit! It’s here: Paperback release day! If you’ve been holding out for something more tangible because you haven’t jumped on the e-book train yet (what are you waiting for? ), now’s your chance to finally get it! Grab a copy today. Tomorrow I will be on reddit as the r/Fantasy Writer of the Day, and I will be giving away 1 paperback to the person who asks me the best question. I’ll post the link to the thread tomorrow morning. Finally, don’t forget that my e-book version is free all this week to celebrate the release of the paperback. I’m currently getting a lot of downloads – I’m #11 in Epic Fantasy and #81 in Fantasy overall! The last 24 hours has been great exposure (that, admittedly, I hope turns into future sales), but I’d love to get it into the hands of even more readers. Please tell your friends and family and help spread the word. Thank you to all my friends and family for their continued support. Surprise! 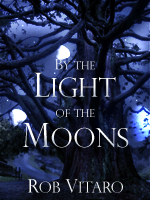 By the Light of the Moons free e-book this week only!